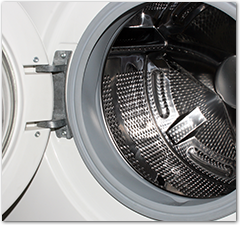 Once you call or email F Morris Appliance Repair in Wisbech, Cambridgeshire for washing machine repairs and parts, the process is straightforward and simple. After visiting you the same or following day to identify the problem, I fix your machine on the spot or arrange fast part delivery so I can come back promptly to sort your repair, at your convenience. Contact F Morris Appliance Repair for reliable washing machine repairs and parts; also providing reliable washing machine servicing to keep your washing machine working efficiently and correctly. Contact F Morris Appliance Repair for reliable washing machine repairs and parts.